What size throttle boddies for a 16v? I've heard that 40mm is optimum, Not sure what the reason behind this is, but I have found a set of 45mm from a 206 GTI, will these be ok to use? will be fine. jason you need to search on the fourm of past threads to do with TB's, as this has been mentioned many of times. Yeh i used the search Ross, I know I can use the 45mm Boddies, what i'm asking though is how well are they suited to the engine as I heard 40mm was the optimum size, will it make the engine to peaky? I think Sandy309 used 45mm TB's with great success. Are these going to be ok on a VTS engine? I know i need to get the inlet (Which ive already sorted) But will everything else fit as intended? In particular the GTI-6 injectors and fuel rail? I have been told these injectors are enough to flow 230bhp, will these be a bit overkill as i will be running 165-170bhp? Or will they end up being beneficial if I was to add Nitrous at a later date? Inlet length is far more critical than diameter with TB's, 45's will be fine of the 16v, i've had some great results with them as Dave said. The only problem is you'll have to use the Chadil manifold with those, unless you get one fabricated, which will restrict inlet length, becuase it's designed for mounting carbs near level and points them at the brake bar. You'll have to excuse my limited knowledge but what is a Chadil manifold? Why would I need to use that? Can you recommend a better set-up over this one? It is designed for DCOE carbs, which can't be mounted more than 7 degrees from horizontal. It's also got unequal tract shapes to convert the 84mm spacing of the ports to 90mm DCOE spacing. Because the bodies will be near horizontally mounted, the brake bar on the bulkhead severely limits the avaiable space for trumpets, limiting overall inlet length from trumpet mouth to valve to around 290mm, way short of the 330-350mm I'd aim for with this kind of engine. Could someone make this thread sticky so i don't have to keep making these elongated reposts please? Thanks for the post Sandy. Sandy, have you seen any results from the KMS direct to head bodies yet? How do they compare to the Jenvey SF/ST's. Have you seen this thread on the SSC forum? BMEP of 215psi at 5500rpm, that's about as strong as you can ever expect the mid range to get and it will be very quick on the road/track, I doubt very much he'd see a "real" gain from changing the cams, maybe more peak, but bound to loose some of that fabulous mid range. Very pleasing, Matt Sav must be chuft to nuts! Sounds like there could be a bit more to come from that engine with some fine tuning, plenty of torque above 4k though Any idea why it dips so much below that? This is all a bit confusing, I spoke to GMC and Carworx and they both said that 45mm throttle boddies are too big and will loose lots of the mid range. However those DTH bodies are 45mm? Sorry, but they must be up their own asses, i'm seen some marvellous results on 45's and mostly the mid range, which is ironic perhaps! length is more crucial than diameter in my experience. Location: probably in a toilet somehwere taking a dump. length is more crucial than diameter in my experience. 45mm is rather large for a 1.6 engine. 45mm throttle bodies are not the equivalent of 45mm carbs, 45 carbs would be OK but they really are only about 38-40mm in reality, whereas a throttle body is a "proper" 45mm opening. Your airspeed will likely be too slow until you get up to some reasonably high revs, where (in my experience) the car will pull like a train and you will run out of rev range. You can tell this by the car still accelerating madly right up to the red line. Then again, if you're happy with the results who gives a f*$k. The other important aspect is cutting a hole in the bonnet to allow enough air in. My mate lost 15bhp due to cold air restrictions. Now he has a nice big hole cut the bonnet of his AX-GT. My recommendations have alot more research behind them than you might realise. Bear in mind also that 45mm carbs and 45mm bodies do have the same flow capacity if the carbs are on 40mm chokes. On a 1.6 designed to run to 8000rpm, that's about perfect. The Butterfly spindle at full throttle reduces the 45mm body's flow properties to the roughly the same as 40mm open pipe. The only good reason to use smaller bodies is if throttle sensitivity isn't good enough and I can assure you that it is on the TU 1.6, 16v or 8v. I've also got the builders starting on the dyno room next week. As soon as its running then I can start some proper development. In terms of flow the DTH bodies are much much better than the SF style. The jenvey inlet manifold really resticts flow, killing any gains to be had from a good BV head. Also the DTH have an almost venturi shape inside which must be helping the torque (along with the way I do the heads). At the end of the day Peugeot must have spent a lot of time and money working on the shape and they seem to have got it right. I think Guy croft made a reference to the Jenvey's on his site somewhere (along with a very poorly flowing head). I´ve just bought theese of ebay. They are 42mm from a GSXR1000. Actually I was looking for the smaller 38mm from the GSXR600, but when theese showed up I couldnt resist. My brother are also looking for bodies for his Capri, so I might pass them on to him. My 106GTI engine (to be put in my AXgt) are supposed to be blueprinted by Skip Brown(the seller havent sent me the paperwork to show for it though) and have a pt50 cam. What would be the best suited bodies? The 42mm ones I´ve already bought, or the smaller 38mm ones from GSXR600? Personally i'd favour the 42mm. ^^^ I'm glad you said that. Matt - I'm kind of hoping my head will be one of these monster flow jobs. I take it I will be getting the revised big valve head? Get that bloody dyno cell built! Sandy, do you have your own company? I'm a fully registered, tax paying, independant. Cheers, that's a very kind thing to say! I've finally got around to scanning some results I have for the Direct to head throttle bodies. The engine had been optimised for cam timing, ignition and fuel on a Jenvey SF setup and had been running (it a rally car). Before they changed the bodies they took a power run. Then fitted our Direct to head bodies and optimised the cam timing and remapped the engine again. The results are quite impressive. I think you can safely say the Jenvey setup was strangling the engine. The engine spec is a bit vague but has a longmans head and piper cams. Later this year it will be treated to a set of Catcams to see what it is capable of. The rev limiter has been lowered with the new bodies as it peaks a lot earlier. The car is completely different to drive. shockingly bad torque for the bhp. the bmep on that engine is only 192psi. my engine bmep is 202psi. not saying the dth arn't better. but i dont think his sf inlet setup can have been what it should have been. edit to add: am basing this on std bore size which it probably wont have so psi could be 190, anyway. That's a great result! I'd be interested to see a similar comparison on a standard or road spec engine. Perhaps also to see how my DCOE manifold with TH bodies compares. Was the tract length and manifold/throttle/trumpet bore comparable? Was the Jenvey manifold ported previosuly? The SF one I did last, I matched the manifold to the ports properly, which needed quite alot of material removal (not ideal granted); the top side ends up very thin too. The same seems to be true with the Jenvey 20XE SF manifold. When designing my DCOE manifold, I deliberately made sure there was plenty thickness on the topside for prospective porting. As far as I know it was on 45mm Jenvey's with the trumpets as long as would fit so similar to the DTH bodies. It should be egtting a set of 810's later this year will see it nicely over the 200bhp mark. The basic difference is an extra 30cfm@25" of flow combined with the venturi shape of the DTH's. The complete spec of the engine is relatively unknow as it was what the car came with. Its still on hydraulic followers. We've got a Kit car exhaust manifold coming for it next week so the results from that will be interesting. The valve sizes are unknown but its supposed to be a Longmans head. That'll be good. We've only had limited time on the one we've been using, which is a bit frustrating, but it's opened my eyes a lot; it's a hell of a lot easier to be scientific than in the rollers! I'll have access to another soon when it's in, which hopefully I'll be able to spend some proper time on. 200bhp on drollies! Nice, give me those cams. Lets hope mine makes the 190 then. Sandy would you can to explain how the air gets to the cut scuttle so well? Its something I am relying on to work with my setup you see. The area at the base of the windscreen is higher than ambient pressure when the car is travelling. This cause a natural flow of air into the scuttle, which is why air come through the interior vents even with the fan off. The same flow of air will travel into the engine bay if you cut a section out of the scuttle panel. The is easily proven by the air temp under way. Most of the time with rear mounted induction you'll get about 30-35C air temp at the trumpets, my 309 shows this almost all the time for example. But with the scuttle cut, it'll be nearer ambient. Mapping Vossy's on the road the other day (cut scuttle) the measured air temp was a steady 19C, with ambient temp about the same. You won't see this on the rollers though, there simply aren't any aerodynamics at work; which is probably why some people are sceptical. Thanks for the incite Sandy. I plan to cut my scuttle, I have no choice. Has anyone bothered with an air feed to the trumpets then, or is it not worth the hassle? I was going to box the trumpet ends off and place a panel filter at the back of the box? It sounds like a single sock filter might be all I need? This is something I may need to try both on the rollers and on the road to get the best overall compromise. I wouldn't bother with an airbox unless induction noise is a problem, it will almost certainly reduce power, unless you have the time and resources to "develop" it properly. Likewise, i'd definately steer you away from socks unless you can't get a bar type filter on. Socks seem to sap power. But they are preferable to ingesting dust and dirt of course. Yea you have pretty much backed up the route I had already planned to do. I should have read what I posted. I meant a foam bar filter, there is no way I will be fitting individual socks! Do you bother with cold air feeds, or do they have no effect? I'll try it out anyway. Here's the spec cut from my project thread, so you get an idea of what I may need induction wise. I'm satisfied that cutting the scuttle provides sufficient cold air. Thats good to know, it will be interesting to see what the engine makes in and out of the car to compare. is a gasket needed when fitting inlet manifold ? 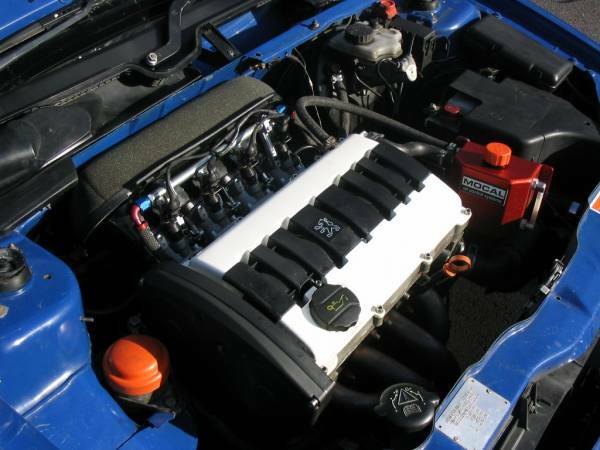 The standard 16v manifold uses foam o-rings. If you're fitting a TB manifold, use an adhesive sealer, my preferred is Loctite 5699 Grey. intersting to see some of our very old development work in the graphs from our old dyno. As for the debate aboiut size- the MAXI and the KIT CARs used 48mm taper bodies.